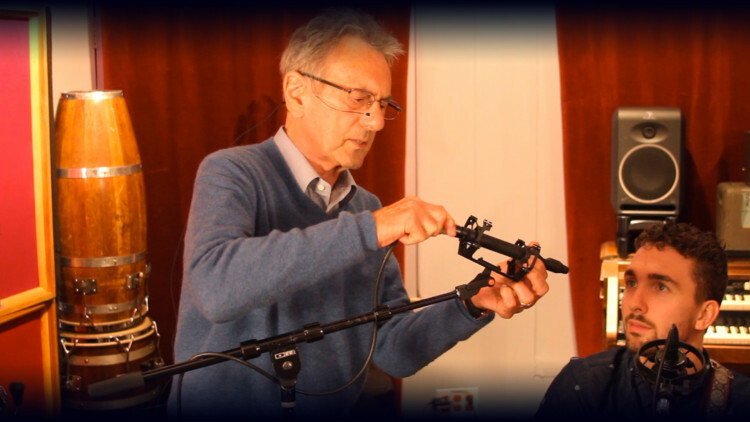 In this video, the ever-amazing Al Schmitt records the singer-songwriter Will Knox, while sharing his life-long experience in the music industry. He experiments with various microphones and mic placements to achieve a sound that's worthy of his sky-high expectations. Al also tells us about his idea of mixing a record and how much treatment should be applied, as well as his own philosophy regarding sound engineering. If you would like to know more about Al Schmitt please visit his website. Hi everybody. We're here with Al Schmitt and we're gonna do a little bit of miking of a singer-songwriter. - Let's put one of these on the guitar. - Alright! - So we need a... - You mean a mic stand would be useful? - It's a CU-55 that we're gonna put on the guitar. - We'll use one of these on the vocal. - You get comfortable, I'll move around you. Don't worry about that. - So you're aiming for the sound hole of the guitar. - Yeah. - Cool! - Are you worried about phase or distance? - No, not at this point, I'm not. - We'll see what happen. - Just vocals or guitar as well? - Both! Yeah, do both. - What did you think about this? - I'm gonna take this mic off and put the 100K up. I just didn't like the way it sounded on the guitar. It sounded a little... muffled. - Muffled? So you want a more open... - I didn't hear the clarity of what I heard in here when he was playing before, so we're gonna change this. Normally I don't do this. Normally my assistant does all this stuff. - Yeah, but today I'm the assistant, and I'm not the best assistant! - Did you put a windscreen on here? - No. Let's do that! Your popper... Monsieur Knox. - You don't have anything to do until Saturday, right? Since it can take a while... - It's all good! - It's basically the same position. - Pretty much the same, yes. - You're just trying a different mic color. To summarize: Al switched the CU-55 for the 100K, it was a cardio, now it's an omni, and this mic is supposed to have a very wide, super broad high-end. Amazing! What are you hearing here that you like or don't like? - Well I like what I'm hearing pretty much. I don't think there's too much voice in the guitar mic. And there's certainly not too much guitar going into the vocal mic. The things I would do, you know, is add a little echo to it, to his vocal maybe, at some point. And that's it! I never use EQ. - You don't use EQ at all? - Ever! - When I learned, none of the boards had EQ. We had one equalizer, and if you used it, it equalized everything. - On or Off! Make you selection, at any time. - So we learned not to use it, and the same with compression, we used very little compression back then. - I think that's wonderful. So basically, say if you didn't like the sound of what you heard right now, we're lucky you do, if you didn't, what would you do? - I would change the mics. - You would change the mics? - Yeah, absolutely. - You also mix a lot of records, you don't just track. So, what I'm getting from you, when you mix a record, you also avoid using EQs? - Yes! The only time I use EQ is if I've got something that someone else recorded. If it's something I recorded, I never use EQ. - So your mixing process must be incredibly fast. - It is fast! - For example, what's the record you've done recently that you like the sound of, that you're proud of? - I like the sound almost of everything. - So in the context of a record, and I know you do, where there's backbeat, and a drummer hitting hard, you're still able to do it without EQ and compression. - Yeah, I do, yeah. I use a 452 on the snare, and I have a 57 under the snare, out of phase. that gives me all the pop I need. - I think that's the most refreshing thing I heard in a long time. - Tom Dowd. - Yes, for eight years. That's just the way I learned. I've been around it since I'm 7 or 8 years old, and, you know, I watched when they had to take their shoes off while they were recording, so you couldn't hear the stomping. So we're gonna take this off. Not that we didn't like it. We liked it. But we're gonna change it to see... - Just to see how it feels. - There's a lot of fear about omni microphones. A lot of people don't know how to use them. - No, no! Leakage is your friend. - Leakage is your friend! Why? - It makes things sound much better. If you have a cheap mic and something's leaking into it, it's gonna sound that cheap sound. But if you have a great microphone, and you got leakage coming into it, it just opens everything up even more, it makes things sound so much bigger. That's why on all my string dates, and all my big band dates, almost all of the mics are in omni. Almost all of them. And we don't worry. The leakage is what makes it swell! - Great. - Swell! - So, Will, how are you feeling, having played that song about 800 times in 24 hours? - Do you know anything else? - It's the only one! - Here we go. chest on this mic, you know. If I was recording him for a record right now, I would probably change his mic and add something else that had a little more of a chest. - Do you ever use 2 mics on the vocal? - Not really, no. - So you find a mic that works. - I find one that works. And sometimes it can be a 50 year-old mic. - I think this change was fantastic. I liked the tone of it before, but changing this mic opened up the top. - To the lead. Isn't it a wonderful song? - Yeah! He's terrific. we learned the song as quickly as possible, and then we would ride the gain on the vocal. - Manual compression! - Manual compression, exactly. And that's what I do all the time, with Diana Krall, or with whoever I'm recording. - That makes for a certain very special sound. - Well, it's a way you learn something. You know, I've done that ever since I was a little kid, so it's just come second nature to me. I tell people what I do, I don't tell them to do that! But I find a lot of my assistants who have worked with me for a while all do that now. - Well, to me it's a better sound. The least amount of processing is the best amount of processing. - Thank you Will, that was masterful, as always. Sometimes, just moving a mic an inch makes all the difference in the world. My microphones are my EQ! That's how I work. - We saw an incredible difference just between those two mics, with the same performer, in the same room. I think it's fantastic. - My pleasure! - For the incredible wisdom, and for letting us know how it should be done. it was my pleasure to work with the Sanken mics that I haven't used before, and to get to know those microphones. - I think the things that were said today are very important and I'm really, really happy we were able to capture that on video. If you would like to know more about the amazing Will Knox, please visit his website. 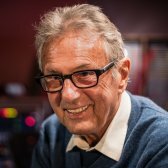 Al Schmitt is a mixing ang and recording engineer whose talent has been showcased over more than 150 gold and platinum albums. Al has been around since the beginning of the music recording industry and has witnessed all technological changes that occured in the past decades. His is the proud owner of 24 Grammy Awards (no less) and has worked with the biggest artists and producers in pop, jazz, classical, and country musics. Everybody who has attented a recording / mixing session with Al says there is something magical about the way he does things. His intuition and years of experience allow him to position microphones faster than anyone else. He just knows how it is going to sound. Then pushes the faders on his Neve console and that's the sound everybody was waiting for. Al Schmit's love for minimalistic eq and compression moves (if at all) makes for a very natural and unprocessed signature sound. He would rather record it right... than fix it in the mix later. You can witness Al's amazing skills by watching him record and mix Cyrille Aimée on pureMix. This is awesome! I've always known this, never touch what sounds good but still going against my own gut feeling. I'm always eq and compressing only because of lack of choices like rooms, mic, interface, preamp, amateurs, etc etc. Great facility, equipment, and talent theres no excuses. more Al Schmitt videos, what a legend! That was extremely refreshing and insightful. Wow, no compression or eq ever material he records. I'm going to try to incorporate that in my recording and mixing too. It will make me work harder to get a better recording. Would love to see another video of Al !!!! Great video, what a class! I would have loved to have seen him do Toto IV. by far the most inspiring I've seen. I love to see video's where it comes down to autodidact style and some common sense with natural approach. Why EQ when you can change the mic. It gives so much more. Totally fabulous to see and listen to Al Schmitt. Creating his sound through his microphone selection. Dispensing with phase altering EQ. In comparison to the completely different technique that George Massenburg is so well known for. Which involves careful manipulation of parametric equalization. So what does Al do? If he gets a recording track by George? What does George do? If he gets a recording from Al? Will George then EQ Al's recording? And will Al try to undo the EQ that Massenburg added? Or do they both just growl and snort and Say nasty things under their breath about each other? "LEAKAGE is your FRIEND"!" (When you use good mics.) I love it. The name Al Schmitt has appeared on records I've loved since before I read album credits. I could spend days hangin' in a studio just to watch and listen to this master. THANKS so much for this video. Incredible.... To be half the engineer that man is would be the highest aspiration I can imagine in my career. We can all learn from his approach... Am I going to never use EQ again? Doubtful. Though, it really does challenge the ubiquitously popular notions of fledgling engineers, twisting knobs just for twisting's sake, or putting their "touch" on everything. Trying to process EVERY track was a mistake I had to unlearn when I became serious about my craft. But to see someone like Al work is simply nothing short of amazing, for every intent and purpose of the word. Awesome video... back to basics and back to the true Craftsmanship of our artform! Great stuff, Fab! I'd love to see you step up the challenge and get a strummer/basher type player and record that simutaniously with the vocal. I've battled that type of singer songwriter for 25 years and it's always a struggle. In fact, I most often end up using 1 mic because phase is such a problem when either the vocal or guitar are out of balance volume wise. I'd love to see what Al or George or yourself would do with talent less than Will or Diana Krall. Thanks! @mer: we did not discuss his reverb techniques. this was solely focused on mic placement. He does mean reverb when he says echo. Hey Fab, did Al talk to you about panning 3-5 reverb returns a certain way on the vocal track? I assume he meant reverb when he says echo in the video but I want to know his effects techniques since he doesn't eq anything. Thanks! Wow. I didnt know some engineers use different mics as EQs. Al Fab and Will: Masters! I did really enjoy watching George in previous recording video and now watching Al to work his magic just puts a smile on my face. Thumbs up to Will, on every video he always puts in emotion into performance which is pleasure to listen.